I have been debating for months whether or not to sew a weighted blanket for my son, but I see the DIY tutorials and get scared. They seem like a lot of work to make and polyfill pellets are expensive here. So I wanted to try a different solution: stretchy lycra sheets. They provide the same kind of proprioceptive sensory input, but also allow for fidgeting. Plus, I figured that I could make one for super cheap. 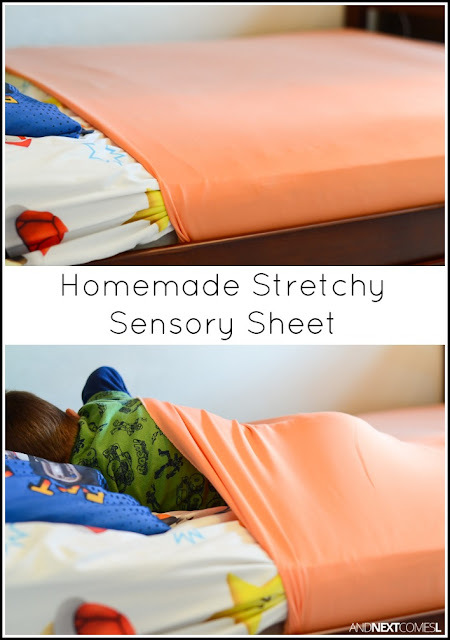 Before I splurged on some fabric for making some homemade stretchy sensory sheets, I wanted to make sure my son would actually like the idea of it. I took our homemade sensory tunnel, which just happens to be the same length required to wrap around my son's mattress, and tried it as a temporary sensory sheet. It worked really great, especially during bedtime reading. Finally, my son wasn't rolling around and doing somersaults while we read together. Instead he would lay calmly underneath it. I decided that it was worth making a trip to the fabric store and finally making a legit stretchy lycra bedsheet for him. The inspiration for this project is this stretchy lycra sheet that costs $70! Thankfully, my final price tag was $15. First, I measured the entire dimension of my son's mattress, top, bottom, and sides included (it was 120 inches). Then I converted it to metres so that I knew how much fabric to purchase. I needed the exact same amount of fabric that I used to make our sensory tunnel: 3 metres (which is about 3.3 yards). However, in the end I had to cut off about a foot to a foot and a half off to make it tight enough to provide good sensory input to my son. So K and I headed to the fabric store to look for something in the clearance section. I was looking for stretchy and cheap. I didn't care what color it was as long as the price was right. It also didn't have to be lycra as any stretchy fabric would work. I ended up searching and searching and finally found this peach cotton spandex blend for 70% off. So I paid $15 for 3 metres of fabric and I was happy as a...wait for it...yes, as happy as a peach. At first I thought the color was hideous, but it's kind of grown on me! To sew the stretchy sheet, it's just like sewing the sensory tunnel or stretchy resistance bands. Take the two ends of the fabric and zig zag stitch them together to create a giant sleeve. That's it! Remember, you can use any kind of lycra or spandex material for this project as long as it's stretchy. 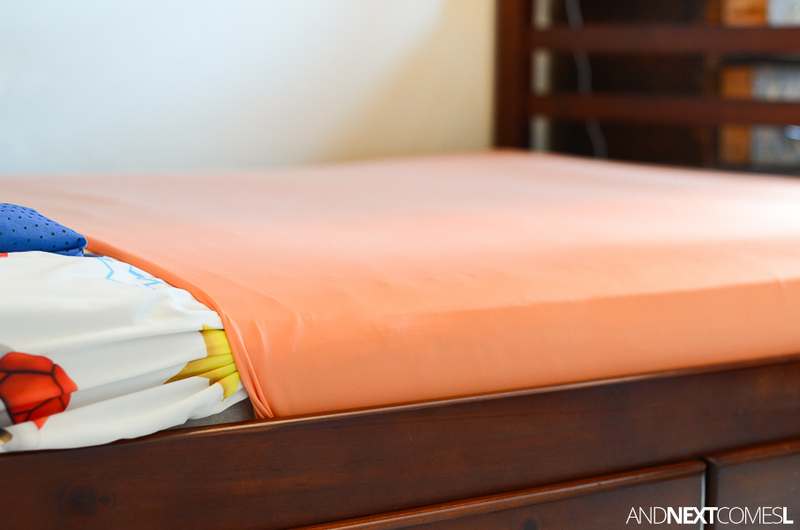 Slide the stretchy sheet onto the mattress. That was challenging since my son sleeps on the bottom of a bunk bed. Then climb in underneath for a calming night of sleep! Now I said sliding the sheet on was challenging, but honestly, photographing this sheet was even more challenging. I had to stand awkwardly in my son's closet or in the hallway in order to photograph it because of the bunk bed's frame. It kept getting in the way! Anyway, photographing in weird positions is just part of life as a blogger! Holy crap, I can't believe this worked. Thank you, I almost spent a fortune on those sheets, I can't wait to try this. HA! Well, leave it to me to share a DIY tutorial first to save some money. Let me know how yours turns out! Does the lycra make it hot? I mean, does it still breathe? My son has never complained about it making him hot, but he also likes to sleep under a mound of blankets every night. Did you also sew the bottom? So it looks like a potato sack? Think that would work? My son wouldn't want his feet to peek out. I didn't mostly because I'm lazy. Also, J's feet are nowhere close to the end of his bed so his feet don't peek out. You certainly could sew it like a potato sack though. I think that's how most of the ones that you can buy are made. How did you determine how tight to make it? I would like to make one for a double sized mattress. Well, to be honest, I just sewed it after I measured the size of the mattress, discovered it was too loose, then resewed it until it felt snug on the mattress. I even climbed inside to feel the tightness of it. Not very precise, is it? But it worked! My guess is it would be a few inches smaller than the mattress' measurements, if that makes sense. I made a weighted blanket for my daughter....only to have her never use it. So I made this stretchy sheet as an alternative and she loves it! I need to make a new one now as she has upgraded to a double bed though. Thanks so much for this idea! That's wonderful to hear! My son absolutely adores his too! Thank you! This is fabulous idea! I can't wait to make some for friends to try. Hope it is helpful for your friends! I'm making this today in hopes of getting my autistic kiddo into his own bed in our room. We've learned that he loves "feeling tight" and rolls around all night trying to stay wrapped up in our blanket. Thank you so much for saving me money and the awful shipping time to Hawaii. Good luck, I hope it works well for your son! Have you had a chance to make it yet? I'd love to hear how it's working for your son! How is it working out for him now?